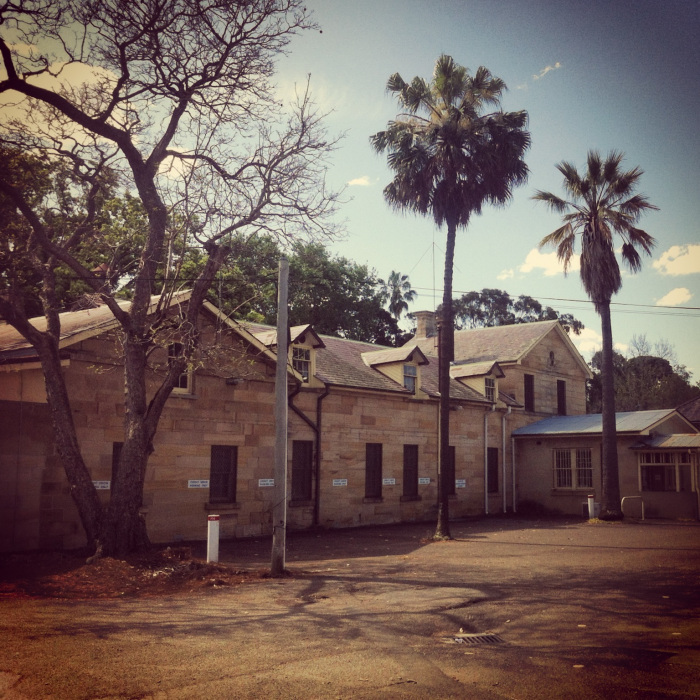 By the early 1840s, Parramatta builder and architect James Houison had already left his mark on many of the town’s most prominent private and public structures; Hannibal Hawkins Macarthur’s Vineyard (later known as Subiaco), St. Patrick’s Church, Parramatta’s first built courthouse (1835), the new Parramatta Gaol, Nathaniel Payten’s George Street home, which was later renamed Tara and became the first location for the Anglican girls’ school by that name (demolished), the Methodist Centenary Church, and a Church street office building for himself and business partner Payten. 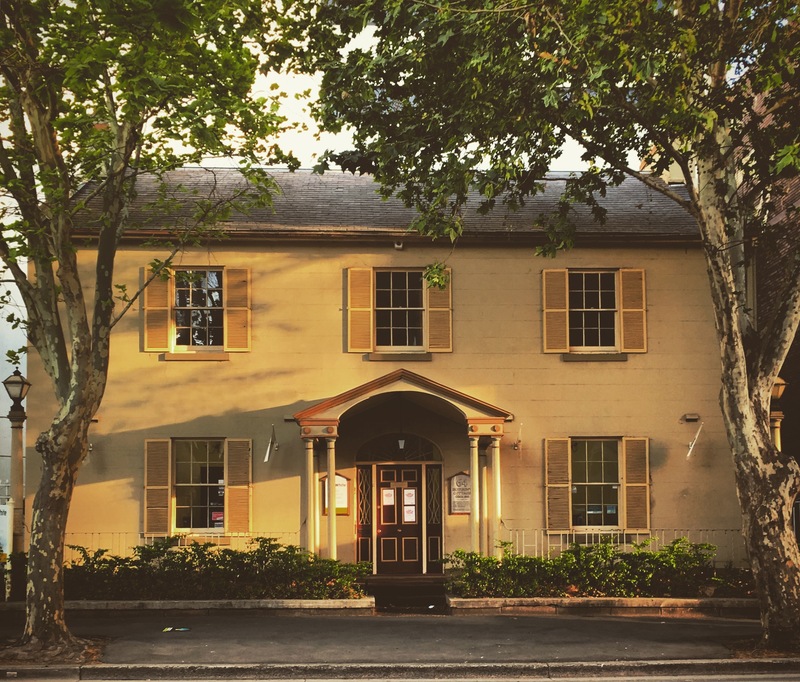 Around 1842, the native of Nairnshire, Scotland turned his talents to designing and building Kia Ora; the elegant Colonial Georgian townhouse at 64 Macquarie Street, Parramatta that served as his family home for the next two decades or so. CLICK IMAGE TO ENLARGE. “Kia Ora,” Houison’s Cottage at 64 Macquarie St, Parramatta. CC BY-NC-SA 4.0. Photo: © Michaela Ann Cameron (2017). Houison’s architectural vision of his familial abode however—great as it was—most certainly did not include an apparition of a ‘he-creature’ of ‘villainous’ intent upon its ‘unique…wide…semicircular, suspended, stone staircase.’ Nevertheless, one Wednesday night in 1844, as his children, Margaret, Alexander, David, Annie, James Jnr, and Marjorie slumbered softly and Mrs. Houison retired to her rest, there came a most unnerving sound: an ‘unaccustomed but stealthy tread on the stairs.’ Soon after this noise shattered Mrs. Houison’s comforting illusion of safe, domestic harmony, she bravely ventured to the landing and there spied a strange he-creature, who bore no resemblance to ‘any of the male portion of the establishment,’ menacingly ascending the ‘continuous flight’ of stairs to the upper-storey of the family domicile. CLICK IMAGE TO ENLARGE. Houison tintypes. The architect James Houison himself is pictured to the right. On the left is a female member of the Houison family, which one source states is Mrs. Ann Houison (née Stark), i.e. Houison’s wife. 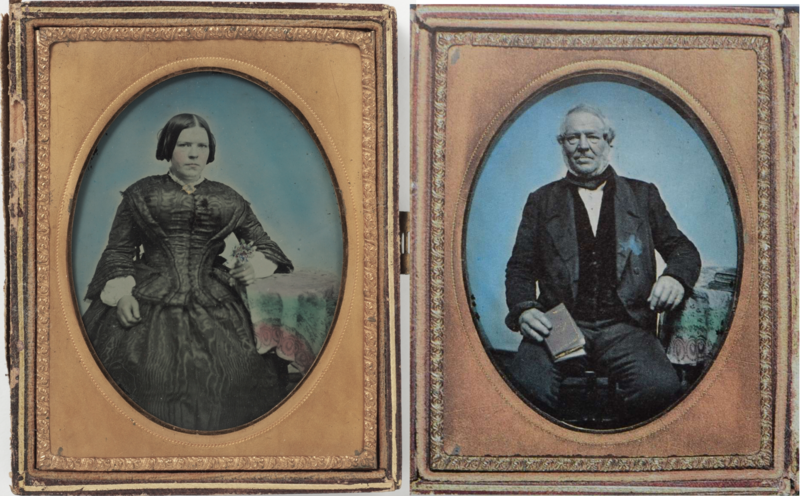 However, the couple were only three years apart in age and, to all appearances, the two subjects pictured here sat for these portraits at the same time in the same setting – yet the female is clearly much younger than James Houison, perhaps only in her teens. The Houisons had nine children, four of which were daughters; one of them was named Annie after Mrs. Ann Houison, which may explain what seems to be the misidentification of the female. 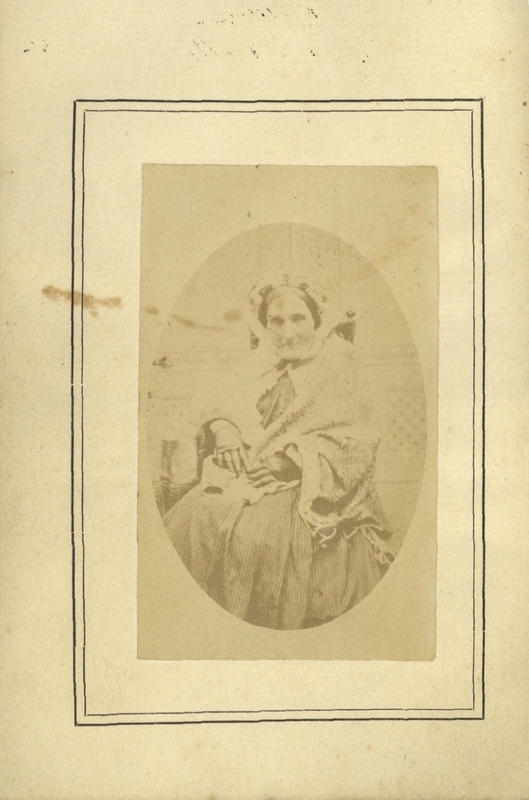 [Left] “Portrait of Mrs Ann Houison (née Stark), MIN 267 / FL233769, Mitchell Library, State Library of New South Wales. [Right] “Portrait of James Houison,” MIN 266, Mitchell Library, State Library of New South Wales. Yes, like a true apparition, the he-creature vanished and was never identified, yet the case came before the bar all the same. For the Houisons were all too aware that it had been no ordinary Wednesday in 1844, but February the 14th: the day of Saint Valentine. As such, it was plainly evident that one of the convict maids sleeping in the Houisons’ attic was also blameworthy, inasmuch as she was guilty of inciting the romantic overtures of the creeping he-creature and had very likely arranged a lovers’ tryst. 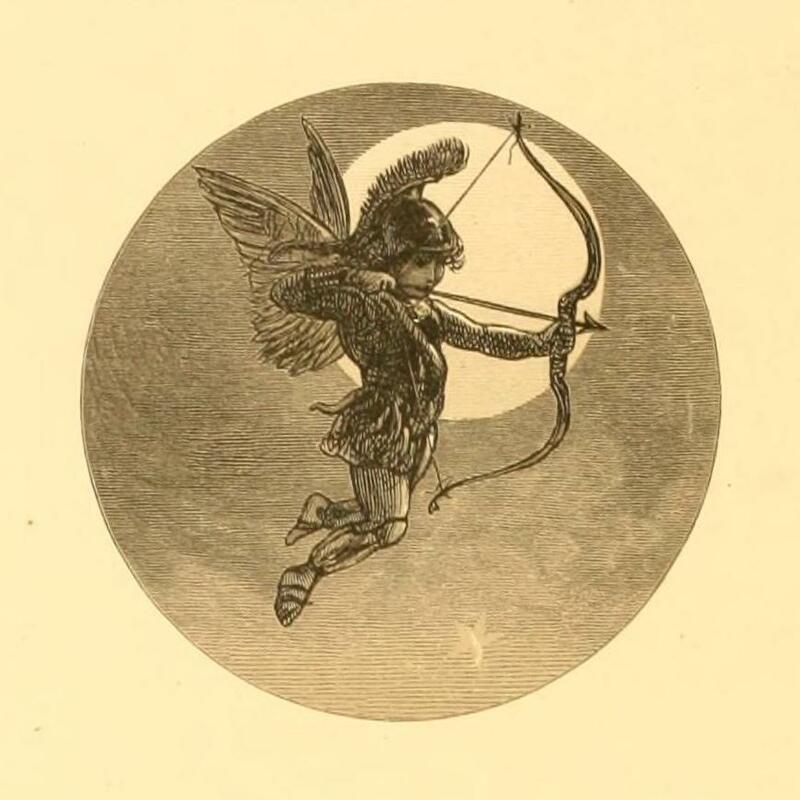 “Flying between the cold moon and the earth / Cupid all arm’d: a certain aim he took / At a fair vestal throned by the west, / And loos’d his love-shaft smartly from his bow…” An illustration by Alfred Fredericks in William Shakespeare, A Midsummer-Night’s Dream, (New York: D. Appleton and Company, 1874) p. 30. Courtesy of The Library of Congress. ‘[S]uch are the blind boy’s vagaries,’ wrote one incredulous reporter for the Australian: ‘he [Cupid] had been flinging his shafts’ willy-nilly! 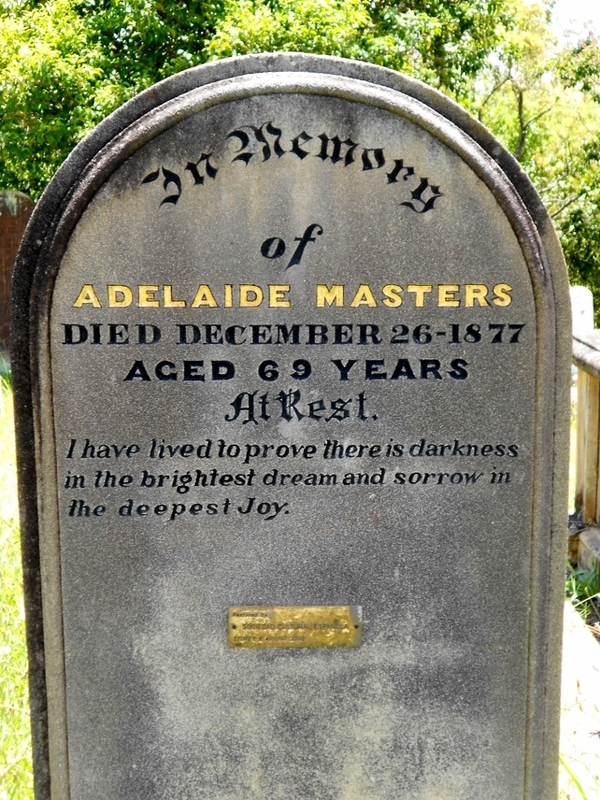 A reporter for the Parramatta Chronicle likewise described the woman as ‘an aged female of rather venerable aspect.’ Both reporters called her ‘Mary Peisley,’ but no such name can be found in the convict records. However, the descriptions they provided of Mary P. combined with the fact that ‘Peisley’ could easily have been a misreading of a poorly handwritten ‘Parsley’ adds weight to the possibility that ‘Mary Peisley’ was in fact Mary Parsley (alias Mary Batey); a five-foot-nothing married dairy maid from Dumfriesshire in the Scottish lowlands who had been convicted at the Cumberland Quarter Sessions on 3 July 1838 and sentenced to seven years transportation for stealing a shawl. When Parsley arrived in the colony per Planter (2) (1839), the details recorded in the Convict Indents reveal that she was 42 years old, could read but not write, had a sallow and freckled complexion (though another describes her as ‘ruddy’), dark hazel eyes, brown hair mixed with grey, a small scar on the right side of her mouth, a semicircular scar on the ball of her left thumb, and two scars on the back of her little finger on her left hand. These details of a woman who, in those days, would have been considered ‘past her prime’ align well with the reporters’ descriptions of the ‘aged’ woman they beheld some five years later and knew as Peisley. Other convict records tell us, too, that Parsley was based in the district of Parramatta. CLICK IMAGE TO ENLARGE. 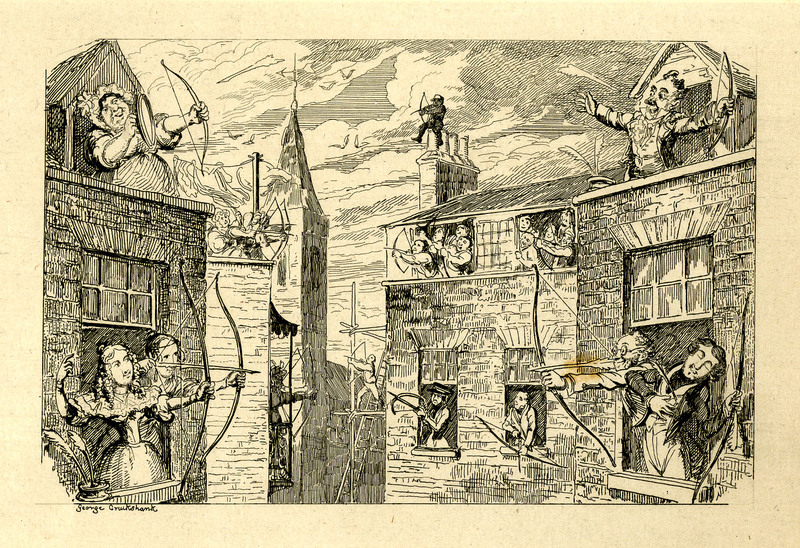 “February – Valentine’s Day,” The Comic Almanack (1837). 1859,0316.618, AN62804001. CC BY-NC-SA 4.0. © The Trustees of the British Museum. Mary P. did not disagree with anything her fellow servant had stated but added that she ‘had refused with dignity becoming the employment she was in, and with a proper respect to herself, the entertainment that had certainly been offered to her by a man whom she did not know, but who had come into the yard at the rear of her master’s premises.’ It was at this point of the proceedings that the people assembled to hear her case caught a glimpse of what may have sparked the infatuation of her nocturnal visitor in the first place; for what Mary reportedly lacked in terms of an alluring, youthful visage she most certainly made up for in personality and homespun wisdom! Mary informed those present that she had also refused the man’s advances ‘because she felt perfectly convinced that where gentlemen, instead of making “cupboard love,” voluntarily proffer such, they unfortunately have intentions of a very villainous nature in view towards those they feast, and she was by no means a female of that sort.’ Indeed! ‘Tis against nature! All ye fair and tender maidens, never trust an unaccustomed he-creature bearing snags and vino! 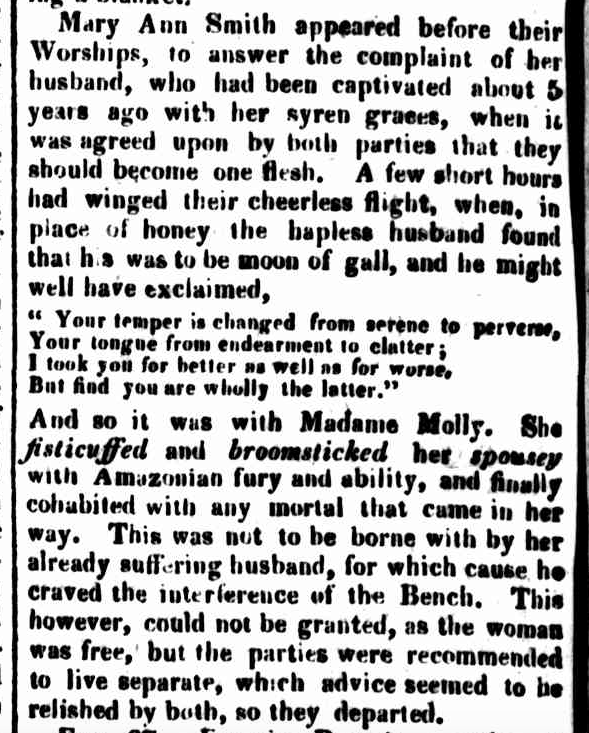 ‘The Bench, not going the full extent of belief laid down in Sir Walter Scott’s Demonology and Witchcraft, as to these extraordinary illusions of eyesight,’ and apparently unwilling to believe that a convict maid would refuse a dalliance, least of all on Valentine’s Day, sentenced Mary to two months in the Parramatta Female Factory’s third class. Furthermore, she was to spend the first and last week of her sentence in solitary confinement — far beyond the reach of a certain ‘weak, susceptible man’ whose heart she set aflutter. Female Factory Online (https://femalefactoryonline.org/, 2019), Law Report of MARY PEISLEY (p18440222), accessed 12 February 2019. Female Factory Online (https://femalefactoryonline.org/, 2019), Law Report of MARY PEISLEY (p18440224-2), accessed 12 February 2019. Female Factory Online (https://femalefactoryonline.org/, 2019), MARY PARSLEY (1794–n.d. ), accessed 12 February 2019. Terry Kass, Carol Liston, and John McClymont, Parramatta: A Past Revealed, (Parramatta: Parramatta City Council, 1996). John McClymont, James Houison 1800–1876: Parramatta’s Forgotten Architect, (Parramatta, NSW: Parramatta and District Historical Society, 2010). John McClymont and Terry Kass, Pictorial History: Parramatta and District, (Alexandria: Kingsclear Books, 2015). Robert Summerville, (Thesis), “James Houison: His Life and Work,” (Kensington: University of New South Wales, 1973). John McClymont and Terry Kass, Pictorial History: Parramatta and District, (Alexandria: Kingsclear Books, 2015), pp. 33–5, 44–5, 64. Terry Kass, Carol Liston, and John McClymont, Parramatta: A Past Revealed, (Parramatta: Parramatta City Council, 1996), pp. 94, 100, 158. “Historic House. Where Batman Was Born. Owned by One Family for Century,” Sydney Morning Herald (NSW : 1842 – 1954), Wednesday 18 February 1931, p. 12; “Historic Building Becomes Modern Insurance Office,” The Sun (Sydney, NSW : 1910 – 1954), Friday 19 March 1954, p. 8; “Colonial Masterpiece,” The Cumberland Argus (Parramatta, NSW : 1950 – 1962), Wednesday 22 November 1961, p. 2. Further information about the home in its glory days: “Eighty-Seven Years in One House,” The Sun (Sydney, NSW : 1910 – 1954), Sunday 19 May 1929, p. 23. Female Factory Online (https://femalefactoryonline.org/, 2019), Law Report of MARY PEISLEY (p18440222); “COUNTRY NEWS. PARRAMATTA,” The Australian (Sydney, NSW : 1824 – 1848), Thursday 22 February 1844, p. 3. “Police Intelligence,” Parramatta Chronicle and Cumberland General Advertise (NSW : 1843 – 1845), Saturday 24 February 1844, p. 2. New South Wales Government, Annotated printed indents (i.e., office copies), NRS: 12189; Item: [X642]; Microfiche: 739, (State Records Authority of New South Wales, Kingswood, New South Wales, Australia); New South Wales Government, Ticket of Leave Butts, 31 Mar 1827–20 Aug 1867, NRS: 12202; Item: [4/4187]; Reel: 952, (State Records Authority of New South Wales, Kingswood, New South Wales, Australia); New South Wales Government, Butts of Certificates of Freedom, NRS: 12210; Item: [4/4401]; Reel: 1021, (State Records Authority of New South Wales, Kingswood, New South Wales); “SHIPPING. Arrivals,” The Sydney Standard and Colonial Advocate (NSW : 1839), Monday 11 March 1839, p. 2. New South Wales Government, Ticket of Leave Butts, 31 Mar 1827–20 Aug 1867, NRS: 12202; Item: [4/4187]; Reel: 952, (State Records Authority of New South Wales, Kingswood, New South Wales, Australia).